At Neotech Products, we know that when people come together, miracles can happen. This is the story of a beautiful little girl named CopperRose. CopperRose was born at Tripler Army Medical Center to parents John and Bridget. 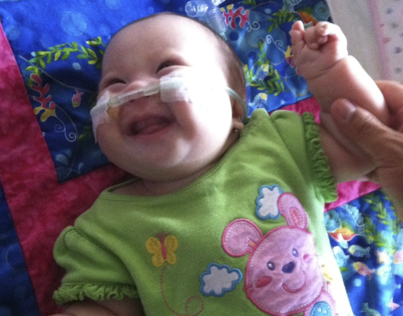 CopperRose entered the world with Trisomy and had spent over 325 days in the hospital. All John and Bridget wanted was to bring CopperRose home. Choosing the right path, however, proved difficult. Eventually, a Neotech mom connected with Bridget through Facebook and directed her our way. Bridget then called the Neotech Home Health team. The events that followed were nothing short of magic. Neotech took to the phone lines and corralled a team to bring CopperRose home. We started by reaching out to one of our RT consultants, Richard, at USC Medical Center. Richard then contacted the Chief Respiratory Care Therapist at Tripler Army Medical Center to discuss the unique merits of one of our products. Next, Richard contacted the medical device manufacturer of the home equipment needed, Philips Healthcare. We then got in contact with the DME company and discovered that another patient was already using this product for home health. Everything came together within a week. In September of 2013, CopperRose finally went home. Neotech Products, the DME, Tripler Medical Center, Philips Healthcare, and CopperRose’s family worked in harmony to make this happen. For us at Neotech, these are the stories that keep us going. Being a part of a team that helps to Make a Difference for thousands of patients, clinicians, and parents around the world puts a smile on all of our faces. It starts with a connection–one mom to another. It continues with a team of doctors and nurses making a plan that best fits the patient’s needs. It ends with CopperRose going home.